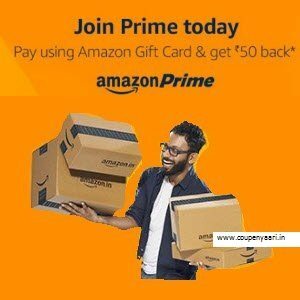 Amazon Free Prime India 1 Year Subscription trick cashback offers. Amazon Prime India 1 Year Subscription + Rs. 50 Cashback Rs. 499. Enjoy unlimited free fast delivery, 30-minute early access to deals and more. Sign up today at ₹ 999 ₹ 499 a year. Get ₹ 50 back when you pay using Amazon Gift Card. Amazon Prime India is just like Flipkart First membership which offers you free delivery with no charges and some other benefits. With Amazon prime enjoy free 1 and 2 day delivery, early access to lightning deals and much more. Enjoy unlimited free fast delivery, 30-minute early access to deals and more. Sign up today at ₹ 999 ₹ 499 a year. Prime members also enjoy discounted Same-Day, Morning and Scheduled Delivery to pin-codes in Delhi, Mumbai, Bangalore, Hyderabad and more cities across India. Now you don’t need to buy Amazon fullfilled book as filler to get free delivery on cart below Rs. 499, just subscribe for Amazon Prime and avail free shipping with other benefits. New offer:- Join Amzon prime by paying with Amazon Gift card and get Rs. 50 cashback. The offer is applicable on purchase of Prime membership only. The customer will receive the cashback Gift Card 30 days after the promotion ends. The purchase needs to be made entirely with Amazon Gift Card Balance, it cannot be combined with any other payment method. The offer is limited to only one purchase per customer during the offer period. Cashback of Rs. 50 would be given as Amazon Gift card. Prime Exclusive Deals – Get exclusive Lightning Deals and Deals of the Day for Prime members on Amazon.in. From time to time, we will also have select Lightning Deals or Deals of the Day that are exclusively for Prime members. Similar to the early access deals, a deal exclusively meant for Prime customers will be tagged on the Deals and Product detail pages. It will also be clearly called out in the “Add to Cart” box on the product detail page. Beauty Products from Rs. 29. House Hold Supplies from Rs. 45. How to Get Amazon Prime India 1 Year Subscription in Rs. 499? In case you do not have sufficient Amazon Gift Card Balance Top-up with Rs. 499. Click on Join Prime Today. Select Gift Card payment method. Thats it. You are now Prime Member. You will enjoy a wide selection of Bollywood and regional movies, US TV shows, and more. And you will also be able to access Prime Video anywhere: on the go or in the comfort of your living room. We will continue adding new and exclusive content, including new original Indian TV shows. Stay tuned for more.